Uncialle’s Halloween Darksite is a trove of spooky inspiration. I love the originality of her ideas and her vast enthusiasm. 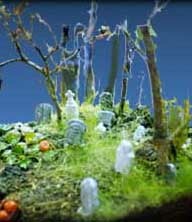 One of her projects that I’ve been itching to try is the Pocket Cemetery: A terrarium made over into a miniature graveyard. She’s made tombstones out of Sculpey clay, uses bare twigs as miniature trees, and even plants grass seed in early October so that the cemetery can be properly grassy by Halloween. My very favorite touch in her cemetery is the little plastic skeleton buried right up next to the glass, with a tombstone appropriately positioned aboveground. Now for the fun! There are countless things you can add. Go wild in a miniatures shop! In her Pocket Cemetery, Uncialle has placed a tiny red wagon with two pumpkins in it, as if a small child had visited, and perhaps run home, frightened. Two tiny, glowing red LEDs are monster eyes, hiding in the shadow behind a tombstone. Miniscule black paper bats hang from “invisible” sewing thread in the tiny trees. A tipped-over vase beside a tombstone spills out dried flowers, while a miniature white pitcher holds “fresh” flowers. Tiny stones can create a stone wall. You could even put in a witches’ hut, a tiny hand reaching from the ground, miniature people, a goblin, or a mummy going for a stroll! A miniature cemetery like this would be an intriguing focal point for a room, particularly if it were in a Victorian glass terrarium or a Wardian case. Add a blue lightbulb for moonlight, and you can have your own little pocket of gloom to meditate on even when it’s perfectly sunny outside.